A playlist featuring 10 of the Metallica frontman's best guest appearances, including live and studio cuts. John 5 has premiered a cover of the Metallica classic, "Enter Sandman." Watch Metallica's James Hetfield and Kirk Hammet discuss their Ernie Ball Contest, Metallica HQ and more in these new videos. Ever wanted to hang out with James Hetfield and Kirk Hammett at Metallica HQ? Here's your chance! 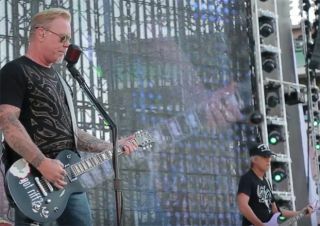 Metallica's James Hetfield was unharmed after a frightening fall during the band's performance Monday night, September 4, in Amsterdam.